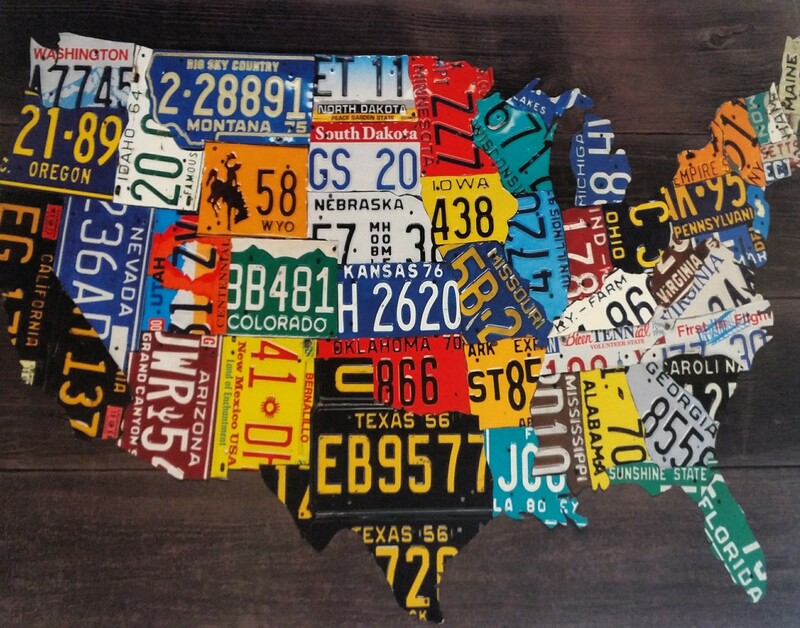 License plate artwork discovered at a Denny’s restaurant, somewhere out on the open road. Brenda Cordray was one of the first people I “met” through Instagram. I somehow stumbled upon her feed @twentyonefeathers and thoroughly enjoyed her photos, especially the ones of flowers and heart-shaped rocks and other little bits of nature. She and her man are nomads, so I introduced myself and my blog to her and offered her the chance to write a guest post. That guest post is now in front of you. Today Brenda will share her tips for finding fun things to do in the new places you visit whether you’re on vacation or living the life of a rubber tramp. After 5 years of both solo and tandem road life, I am often asked about boredom. Don’t you ever get bored? I am not a person who experiences boredom. I have often said that I have a rich internal life. I find more than enough things to ponder and consider, especially when I am not stimulated by the hustle and bustle and endless noise of the outside world. I have a dozen projects in the works at any given moment, and many that are sprouting tiny green vines of possibility on a daily basis. The truly creative mind rarely rests. I have been known to sit for weeks out on the desert in my van all alone. I was perfectly content and never needed the sound of anyone else’s voice for entertainment. Now that I am newly married, my nomadic experience has changed quite a bit. These days I wait patiently for my beloved husband, Dan, to wake up so we can enjoy a good conversation about what we would like to do with this one blessed day that is unfurling before us. A quick peek out the window reveals our latest sittin’ spot. Sometimes that in itself is a surprise! The scenery outside our windows changes regularly. It takes no effort at all to find things to amuse ourselves out in nature at any given location. We truly are outdoors people, at our best and happiest when we are outside. The outdoors is always fertile ground for exploration, but often we long to venture out into parts unknown to store up precious shared memories. We aren’t fans of touristy venues, although we have been known to brave the crowds (off-season or on weekdays) to see things that are of keen interest to either or both of us. I love to post pictures of unusual or off-the-beaten-path locales! It is my joy and pleasure to be the navigator, so it falls upon me to ferret out these treasures. How do I find them, you may ask. Exploration of any area begins with maps. I love old-fashioned paper folding maps, hefty road atlases, Google Maps, hand-drawn simple maps, or even highly detailed topographical maps that others would have no interest in exploring. All maps are valuable to me. Each has a precious bounty to offer if given the chance to tell its stories. Stopping at rest area Welcome Centers as you cross state lines is a great way to pick up free and updated folding maps of any state. I replace my old ones often, although the ones that have handwritten notes along the edges and circles and arrows and plenty of Scotch tape holding them together are solid keepers. Racks and racks of glossy travel pamphlets, some with discount codes or coupons, are free for the taking. There are often helpful folks behind the counter who can give more details about local attractions, like whether or not dogs are allowed, or if the attraction you are considering would be suitable for a preschooler or stroller. They are happy that you bothered to ask and are often a wealth of information for the curious traveler. 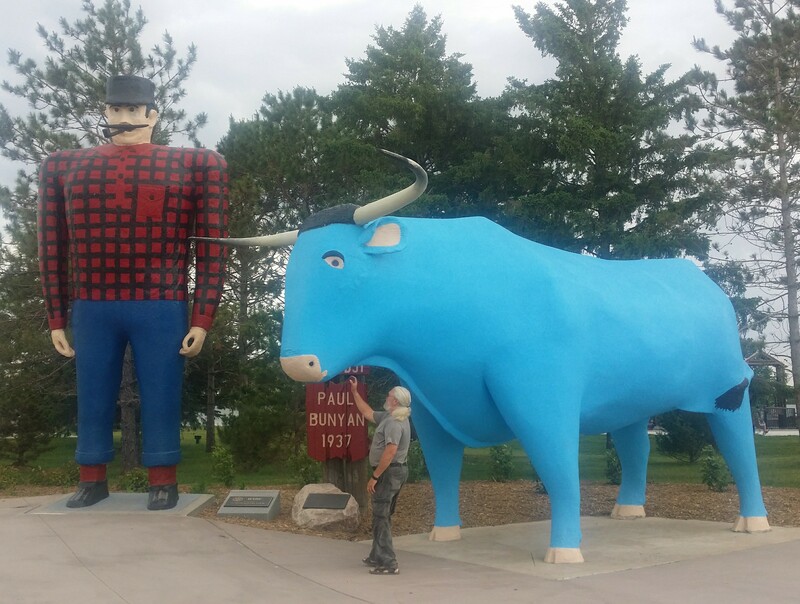 Statues of American Folk hero, Paul Bunyan and Babe the Blue Ox, located in Bemidji, Minnesota. Truck stops, restaurants, gas stations, and coffee shops often have racks of pamphlets, too, and local weekly circulars that include calendars full of events and happenings. Many include descriptions of nearby businesses and are a great resource for buy-one-get-one-free meals or discounts on attractions or services. If I meet a new friend who insists that we go see their home state, or their favorite state, I shush their suggestions long enough to go grab my paper maps and a pencil to mine these priceless bits of information. I often write their names and phone numbers there as well, and where we met, too, since many tell me to call them when we are heading that way because they will have surely thought of more to share. We are given directions and gate codes from perfect strangers in the event that we venture close to their summer cottage or homestead and would like to stay, even if they don’t happen to be there at the moment. If you are a person of integrity, many will entrust you with prime sittin’ spots. Quite a few will suggest that you stay forever, and it will take your very best efforts to politely disengage and ease on down the road. Those who get out of the house now and again will suggest places of interest for your enjoyment. We are very happy when they give reviews of all the best local restaurants, for days when van-made grub sounds less than appealing. If you truly enjoy a certain place, stay awhile. Immerse yourself in the ambiance of the area. Strike up conversations with locals. Some of our best travel tips have come from people we may never see again, but will always remember. The places that we have stayed for extended periods of time are often the places we describe to others who are looking for something fun to do. It’s nice to feel that you truly “know” a place you have just left instead of just having a vague recollection of your visit. 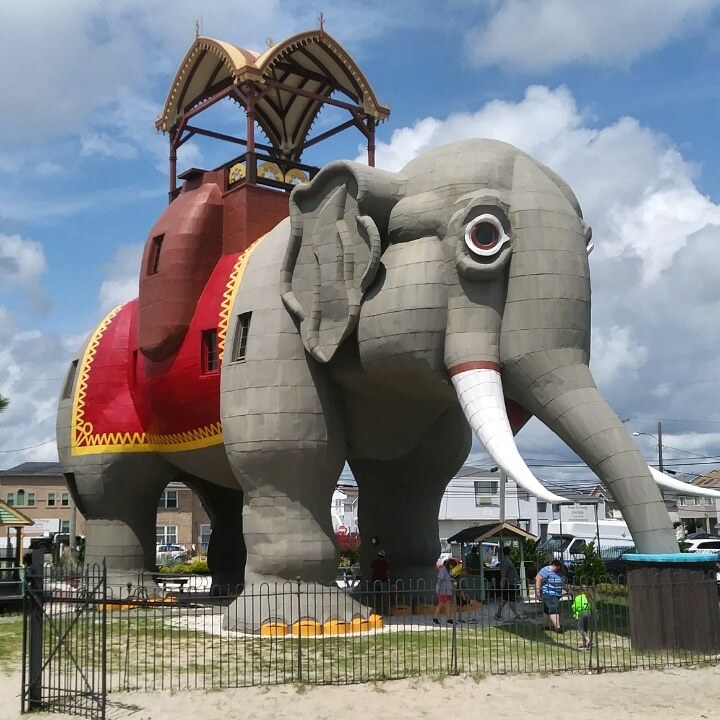 Lucy the Elephant, built in 1881, and located at Margate City on the New Jersey Shore. I am always astounded by driveway surfing hosts who have no idea where the nearest park is or how many truly fascinating things there are to see within a few moments of their home or the neighborhood they grew up in. What fun it is to explore their world and bring it back home to them! Not everyone would enjoy the idea of traveling as much as we do, but one should at least gather up the low hanging fruits of local events and attractions. Weekends aren’t just for chores, people. Recreation is good for the soul and makes the days in between the weekends more tolerable. When tracing a path from point A to point B, Google Maps is also a great resource. Using two fingers to expand the map uncovers all sorts of fascinating places along your route, and entering a keyword like “museum” can add plenty of depth to the outcome of your search. Even if what you find is not something you plan to do right away, tagging that spot with a star or flag can jog your memory in the event that you venture that way again at a later date. A Google search of any area being considered should include the top 15 things to do in a few local cities. TripAdvisor offers a detailed list of the most popular sites in any area.The list also includes reviews from those who have been there and have something to say about it. TripAdvisor is usually the first thing that pops up in a Google search. If you scroll down a bit, you may find blog posts, newspaper and magazine articles, Facebook pages, and a variety of links that will flesh out the big picture and lots of smaller details about the area you plan to visit. Atlas Obscura offers a website that gives you the opportunity to type in a specific location and come away with a list of unusual things to see, like a museum that holds a collection of life and death masks; or the Salt Palace, a museum in Grand Saline, Texas, made entirely of salt. Without this valuable resource, you might pass right by the 200-year-old The Horse You Came In On Saloon in Baltimore, Maryland, whose claim to fame is having served Edgar Allan Poe his final drink. The website includes stories and pictures detailing the history and current particulars about interesting places all around the globe. They also churn out printed books, for those who don’t have to worry about limited space or weight in their chosen road chariot. I carried their book in the van until a fellow nomadic friend who had moved back into sticks and bricks posted that she wanted it badly. I popped it in the mail so she could do a little armchair exploring. Being able to access the same information online is a better choice for me than hauling around a thick reference book. 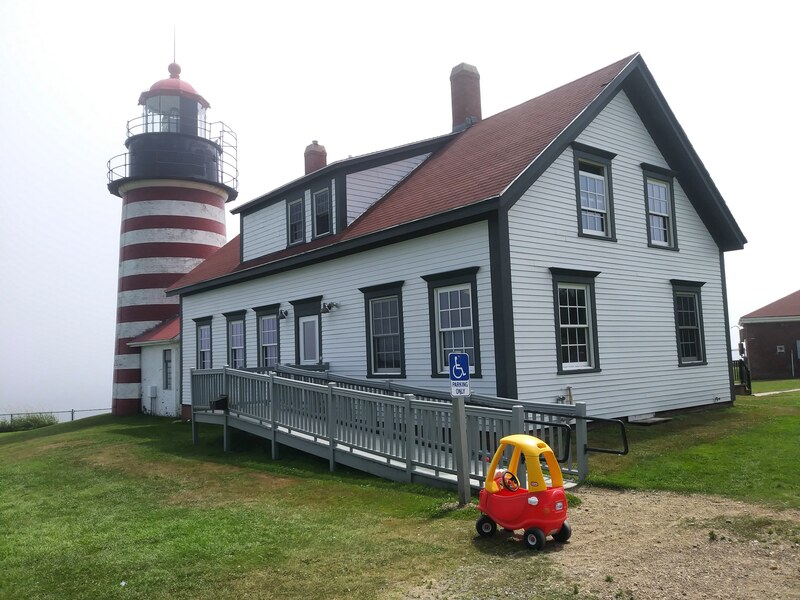 West Quoddy Head lighthouse at Quoddy Head State Park in Lubec, Maine, the easternmost point of the contiguous United States. Sometimes I come across interesting places to see in areas we have just left, like the Montague Book Mill, in Montague, Massachusetts. It is said to hold books you don’t need in a place you can’t find. That sounds like a challenge to me, and I love a good challenge! 25,000 books crammed into a 175-year-old building, perched on the banks of the Sawmill River (which holds black river stones smoothed by cold, flowing water) sounds like pure Heaven to me. That one warrants a check mark for next time, and a sigh of disappointment for not discovering it when we were close enough to stop by. At the very least, Atlas Obscura will show you what you are missing right next door, and will give you something to do when you are “bored”, if you are so inclined. Many of the coolest places we have visited have been the result of serendipitous drive-by discoveries. Once, after taking a wrong turn, we spied a hand-lettered sign that simply said “fort” with an arrow pointing down a backroad outside of Savannah, Georgia. Fort Jackson (the old one, not the modern one) is the oldest brick abutment in Georgia. It was occupied during three wars, and it protected the city of Savannah during the Civil War. Dan wrote a blog post about our visit. We spent an entire weekday in this nearly empty fort, enjoying a personal tour given by a newly hatched tour guide who was very excited to share his knowledge. We were able to really feel the history of the fort without the input of dozens of chattering voices. We easily took dozens of photos without having to wait for hordes of visitors to move out of the way of the shot. We sat in silence after reading the placards accompanying the displays and deeply considered the sacrifices made by our forebearers to secure this nation’s freedom. We mined the treasures of the museum at our own pace, and felt happy to leave a donation to support the upkeep of this privately funded property because we could clearly see its value. We have seen many historic places defaced by graffiti and feel that if people truly took the time to appreciate them, they could not possibly consider such a heinous crime. Reading the blog posts of fellow travelers or following their Instagram or Facebook page posts can offer up interesting suggestions as well. We have been honored when our followers have added to their travel plans or bucket lists based on our adventures! You can find literally thousands of photographs of our travels on our Instagram pages, @twentyonefeathers and @fireman428. I love to find free or very cheap places to visit and camp, so be sure to explore the captions below the photos for a plethora of ideas. Our pups at Camp Wildcat Civil War Battlefield near London, Kentucky, site of one of the Union’s first victories in the Civil War. I offer these suggestions with the hope that you will find a few jewels through the resources mentioned here, and that you also share your OWN gettin’ spots for unique adventures below in the comment section for others to enjoy. Boredom out on the open road is a mindset that is easily remedied with a bit of creativity and a passion for unearthing hidden spots to explore, both near and far. If you are a weekend or summer holiday traveler and not living the nomadic life, you can squeeze more fun into the time you have available by utilizing a few of these resources. As Dan always says, get out, be safe, and go adventure! 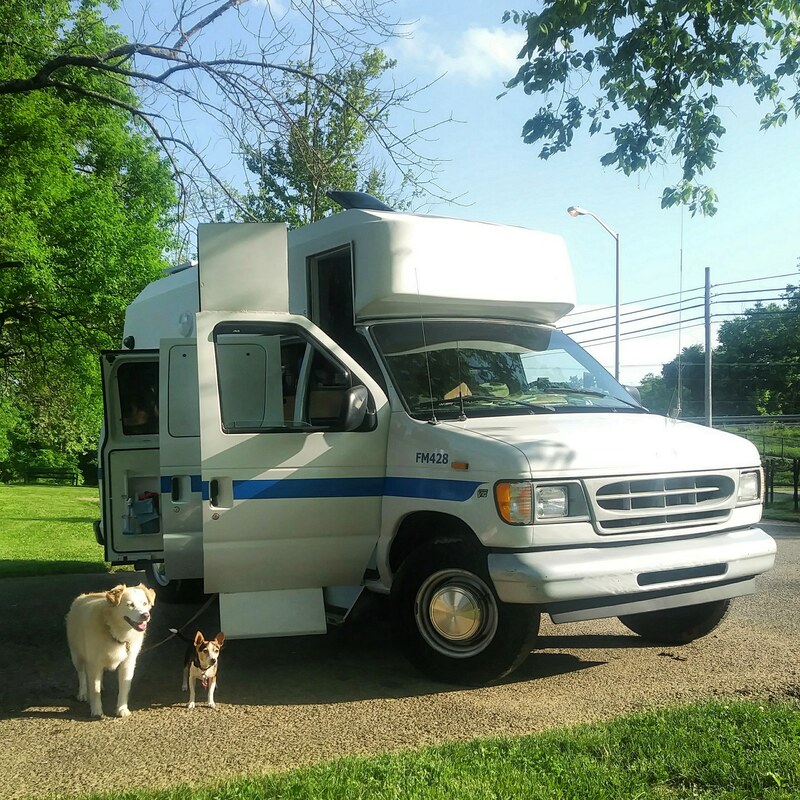 Brenda Cordray is a vandweller who is currently writing a book about her personal journey towards her lifelong dream of nomadic life, and her experiences while living five-plus years out on the road. She is sending out a call to fellow freewheeling souls for interviews about their journey and quest for the nomadic life for possible inclusion in her book. She can be reached at twentyonefeathers@gmail.com. Brenda travels with her husband, Dan, and pups Liberty and Layla, in their repurposed community transport van, Erik van Home. If you need more ideas of what to do with your free time, see the Rubber Tramp Artist post What Do I Do Now That I Have All This Time on My Hands? Photos and their captions provided by the author.